Discount Magic - Multiplying Billiard Balls. The magician produces a bright red colored plastic ball and holds it between his fingers. As the audience watch the ball multiply to two, three and finally four balls. The magician then vanishes them one at a time till none is left. 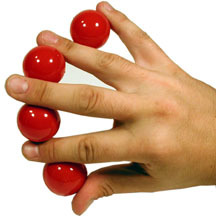 With two sets of multiplying ball, you could produce and vanish the balls from both the hands. they are really nice to do the trick with but they are a b ..